When's the last time you ate in a restaurant with a blue color scheme? Maybe a seaside restaurant on vacation or appetizers in a bar, but I bet you can't think of one. Other than blueberries, there aren't any natural foods that are blue. Blue makes food look unappetizing and can suppress appetite (though it makes you want to drink, which is why it's a color scheme in bars and nightclubs). Ever wonder why the Golden Arches are red and yellow? Red creates excitement and can stimulate hunger. The yellow signifies friendliness and warmth (and is easy to see in daylight). Yep, you're being psychologically manipulated by color in restaurants. OK, what's the point you're trying to make here, you're a copier guy. 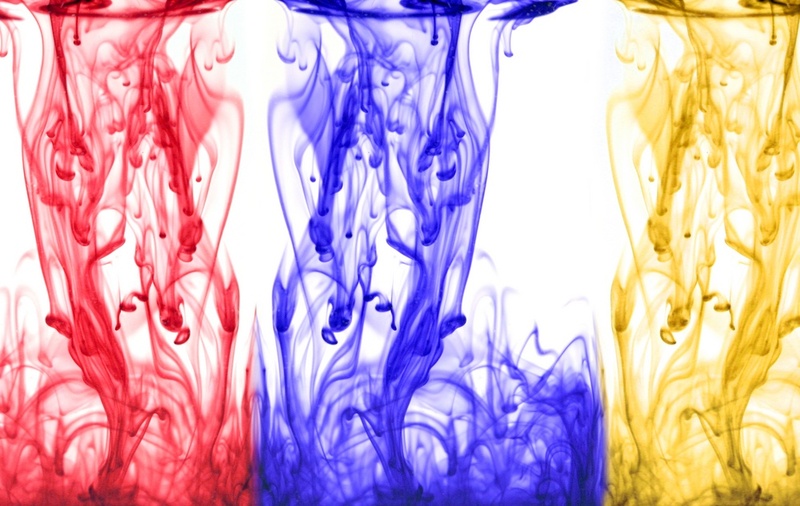 Simply this – smart use of color can trigger desired actions on the part of your customers. But color printing can be expensive. That's why we offer 3-tier color billing. You can take advantage of strategically using color without overpaying. Every industry, not just restaurants, uses color as part of their branding and to convey subtle psychological clues about their brand (want to learn more, this article in Entrepreneur is interesting: The Psychology of Color in Marketing and Branding). “So what if restaurants use the science of color in their color schemes, why does this matter for my business?” you may be thinking. Color increases retention of information and can help you get paid on time – if that's not a good ROI for the use of color I don't know what is. Now that you know why you should use color when it makes sense, here's how to do it cost-effectively. Overall, there aren't a lot of true differentiators in the copier business. One brand might claim the best print quality, another brand might claim the best reliability, and yet another will claim their copiers will make you a prime rib sandwich and toast it for you if you tell them to. The fact is, copiers put toner on paper all using the same basic process and they all do a pretty good job of it. Scanning functionality, various apps, inbound faxing, touch screen interfaces, and others are all similar across manufacturers. One manufacturer did manage to create a game-changer that can be a true difference maker for your business – 3-tier color billing. Introduced by Kyocera in 2013, 3 Tier Color monitors the amount of color toner used on a page and bills accordingly. That's right, you pay for the amount of color you use. Instead of one rate for color prints, the Kyocera line of products we provide measure the amount of color toner on a given page and then assign that page a Level 1, 2, or 3 value. 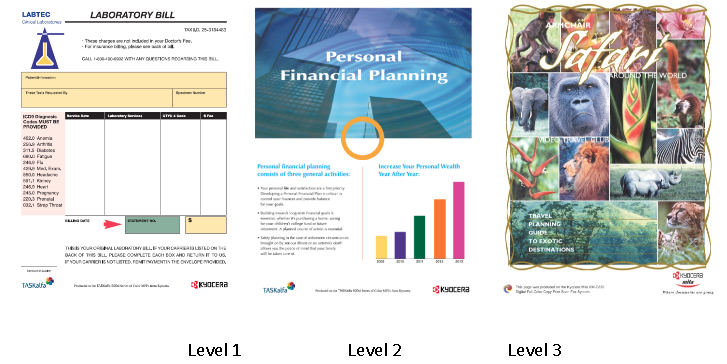 These three images give you an idea of the different levels. We researched our customers and identified that 88% of color pages produced and billed fall into Level 1. Level 2 accounts for 10% of color pages and only 2% are Level 3. For example let's say you have an important email you need to print off. You click file, print, and retrieve the email at the copier. You bring it back to your desk not noticing your company was just billed for a full page of color, even though the copier only used color toner for the little blue email address at the top. Does that sound like a fair deal? Not in the least. It doesn't make sense. Your vendor is charging up to 10 cents or higher per page of color that you print regardless of how much color is on that page. Think about how often that happens at your current job. Kyocera says they can reduce color printing costs up to 50% with this system and they are the only manufacturer currently doing this. So next time you ask a potential vendor how they can help you, keep in mind this real dollars and SENSE difference maker ask for a Kyocera copier and stop throwing money away on your color printing. When I'm out talking to clients and potential clients, I often ask "do you think you do that much color printing?" Nearly 100% say no. My experience in the copier industry leads me to this educated guess - about 20% of color prints are accidental. They were meant to be black and white, but color image files on the page overrode print driver commands and changed the document to color. While I probably can't fix that, I CAN make it cost a lot less when it happens! Now whether you want a single pop of color for emphasis or a full-color brochure, you pay for what you've used, not an arbitrary price for a “color” document. And those color print mistakes won't cost you as much. This is an update of a post published on August 3, 2015.